I enjoy homemade Party Mix. I like the taste but I also have many memories tied to it. Growing up we seemed to only make it around Christmas time but I personally have been known to make it other times in the year, too. I guess I’m living on the edge. There aren’t really as many seasonal foods as there used to be since we get produce flown in from around the world. It no longer seems odd to eat watermelon in December or pears in June. I used to remember waiting very impatiently for grape season to come around in the fall and then eating lots of them because they wouldn’t be back for a year. Candy manufacturers are jumping on that bandwagon, too. I remember how special it was to get a Cadbury Cream Center Egg at Easter but now they make them for Halloween and Christmas. Or Peeps. You can get Halloween Peeps, Christmas Peeps, Valentine’s Peeps. We are an instant gratification society and a marketer’s dream. Repackage the classics and they will sell anytime. Do I like this new don’t-have-to-wait-for-anything mentality? I’m not sure. Although I do like to eat a Cadbury Egg whenever I want to, it does take a little of the specialness out of them. Just a little. And tomatoes. It is nice to have a BLT in January rather than eating stewed tomatoes that were canned with the summer’s bounty, but nothing beats a warm, ripe summer tomato fresh off the vine. I’m thinking seasonal foods are a thing of the past so I guess I need to embrace it and join the instant gratification society, but it does make me a little sad. Anticipation is appealing and fun and brings a sense of excitement. I think we are missing out when we deprive ourselves of anticipation. When we don’t have things to look forward to then life becomes a dull place. 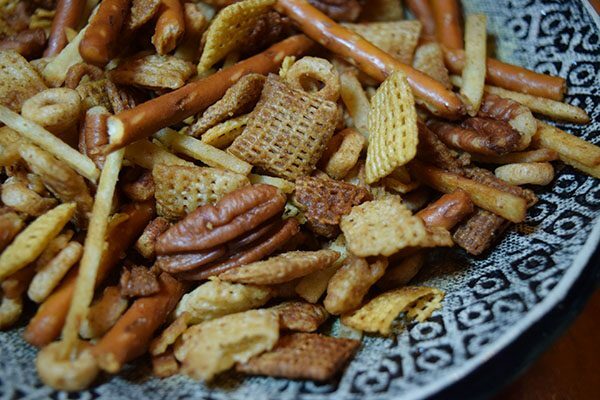 So make this Party Mix and then put the recipe away for a while. When you get it out later, you can savor it and secretly rebel against the mainstream. It will be worth it. Preheat oven to 250 degrees. Melt butter and add Worcestershire sauce, seasoned salt, garlic salt, and Tabasco. In a large bowl, stir together cereals, pretzels, potato stix and nuts. Pour butter mixture over cereals. Mix thoroughly. Place on 2 cookie sheets and place in oven. Stir frequently and alternate racks in oven once during baking. Bake 45 minutes or until browned. Cool, uncovered, then store in an airtight container. I love Party Mix. I’m going to make your recipe the next time I’m home to see my family. I know my nephews will love it.